The fifth key message from the Nile Basin Development Challenge is to ‘adapt new models, learning and planning tools and improved learning processes to increase the effectiveness of planning, implementation, and capacity building’. Planners, development agents and farmers, together with researchers, can use a variety of tested tools to plan and implement rain water management solutions, and to develop capacities of all actors along the way. Tools such as Wat-A-Game, hydrological modeling, Cropwat modeling for crop-water productivity, the Nile Goblet tool and feed analysis tools etc. have been all used and tested in the NBDC and are available for anyone. Catherine Pfeifer, Post-doc at the International Livestock Research Institute (ILRI) and the International Water Management Institute (IWMI), is going back to Switzerland in late December. For the past three years, she was involved in the Nile Basin Development Challenge project (‘N3’) on ‘Targeting and scaling out of rainwater management systems‘. In this interview she shares some views on her involvement in the NBDC and particularly her work around gaming solutions for targeting relevant land and water management options. What range of NBDC activities have you been involved in? My main activity has been the Nile-goblet tool, including finding the data, setting up the database (linked to our suitability data), developing the concept of the tool. In a way, the Nile-goblet brings everything from the N3 project together: concepts, suitability data and adoption maps. This work aims to explain how to introduce socio-economic constraints in biophysical targeting. The other main activity has been the Happy Strategies game which helps people assess most suitable land and water management interventions in a given area. In addition to this, she did a lot of capacity building: A one-week training on geographic information systems (GIS) in 2011 and two training courses more recently this year. Finally there was the learning event last week which introduced the Nile-Goblet tool to members of the NBDC national platform thematic working group on technological innovation. What has been most successful / what are you most proud of? The tools: the Nile-goblet and the Happy Strategies game. 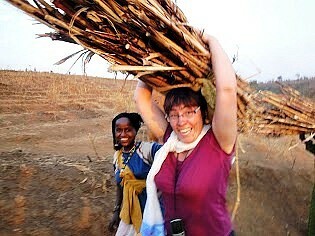 They are taken up by partners (the Water and Land Resource Centre will further promote and work with those tools. They are considering developing them further in future learning events of the thematic working group on technological innovation. The reason I am proud: our initial objective was to get other people involved in developing these tools and we seem to have achieved this objectives. Working with partners has generally been successful, despite challenges (see below). The Spatial Analysis and Modeling topic working group has also been great to work with and quite a success. What has also been successful is the work in our team: as the GIS specialist, I could take care of the adoption maps and developed a participatory tool. The team was very flexible throughout the process. I had enough freedom to do the things the way I thought they should work out. What has been most challenging? Why? Working with partners has been challenging at times, but we overcame challenges. The other challenge was the integration with other NBDC projects. The program aimed to work in an interdisciplinary manner but it hasn’t always worked, perhaps because of the the way the project was set up. I wonder if we really had the space to develop such interdisciplinary work. At any rate we haven’t really worked together across teams as much as we could have. Every team worked in its interdisciplinary approach but this didn’t extend across projects. We missed opportunities to think together about how outputs could have been developed. What lessons learned will you use or build upon (from your NBDC work) in your next job? I want to keep working on integrating socio-economic constraints in spatial models. There is scope to understand how this integration works much better. I learned a lot about it in the past two years but there’s a lot of space for improvement still. What I also really learned was how important it is to involve farmers and mix expert and local knowledge. For example we can do this geographic targeting but it will never be perfect. We need a space to interact, validate and learn and adjust, which is what we tried to offer with the Happy Strategies game. 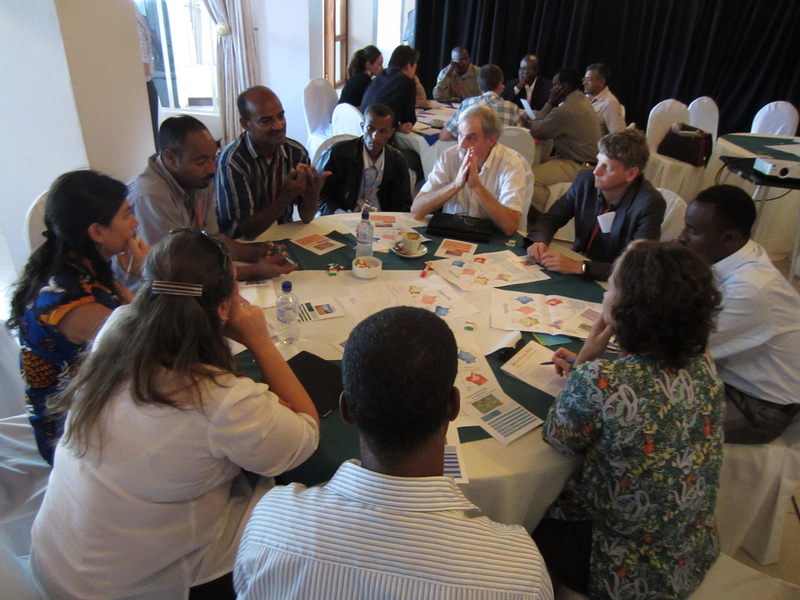 That integration is something where the CGIAR is very strong. I also learned to not be scared, to trust that things will work out in the end somehow… Three years ago, I would have been scared to talk to farmers and now I’m ready for it any time. Any advices to the NBDC for the final year? Get the right people involved at the right moment. E.g. the learning event was small but it brought together interested people and they will take it up. Move away from trying at all costs to bring the diversity of the NBDC together. Think also about bringing similar people together to take over the work. Perhaps in our innovation platforms we would do well to reduce the diversity and invest in people that will take things up. Mind the fatigue of our partners. Only invite partners that can really benefit from the events we organize. Otherwise there is a risk of a lot of talking and nothing much happening. And some partners are investing precious time and money in the events we organize, we need to remember that when planning our meetings. Don’t get lost in interdisciplinarity: Try to link the NBDC teams and people but don’t try to force them to work together. There is a lot of good work that could be used at different scales and for different people. Not everything needs to be integrated. If you really want to integrate the NBDC work, develop a Google layer and look seriously into collecting geo-coordinates for each NBDC output, so it can be shown on Google Earth and linked to actual NBDC documents. This could be the easiest way for NBDC to integrate our work. If I were to stay another year I would work on that and try to develop a public layer on Google Earth or a KML file (for Google Earth) which people can download, click on and display the NBDC outputs. How do you look back at the whole experience? I had a great time. I loved my job. I loved the fact that my job was free, despite the occasional tensions. I’m happy to see it finish nicely. 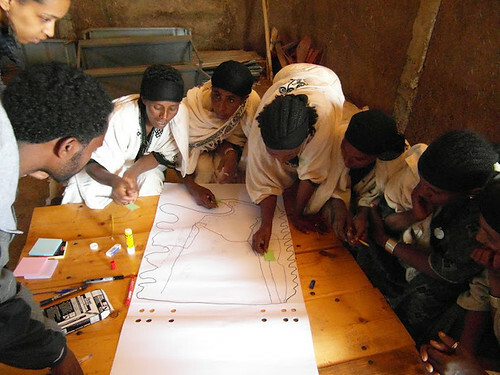 Multi-scale participatory mapping to answer the question: Where does which rainwater management strategy work? One of the sub-projects of the Nile Basin Development Challenge (NBDC) – ‘Targeting and scaling out of rainwater management systems’ – aims to map which rainwater management strategies work where, targeting specific strategies and scaling them. We understand rainwater management strategies, to be a combination of rainwater management practices that increases water infiltration in the up-slope of a landscape, increases soil and water conservation in the mid-slope and increases water productivity in the low slope. Rainwater management practices are very broad and include, beyond rainwater harvesting, a whole range of practices affecting crops, livestock and trees. The maps generated by the project are based on biophysical suitability criteria and socio-economic constraints identified in literature and through stakeholder consultation. Having generated the maps of likely areas where a strategy might be adopted successfully, the project team is ground-truthing the analysis by assessing adoption rates of rainwater management strategies in different locations. A multi-scale approach is required to carry out this assessment. 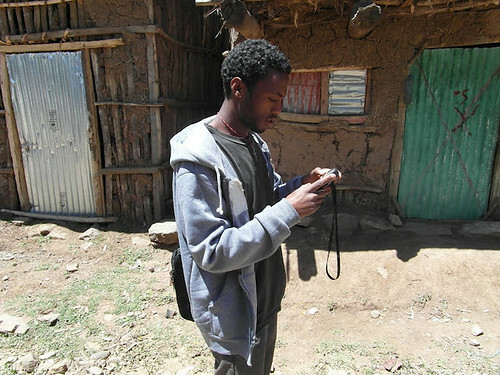 In the Amhara region, Maksenit watershed (near Gondar) and Zefie watershed (near Debre Tabor). The sampling of the farmers covers high-, mid -and low slopes in each landscape and represents female-headed households proportionally. 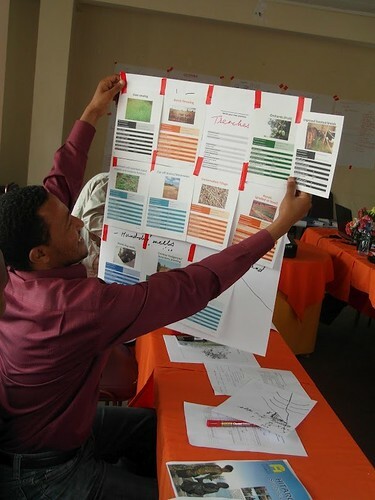 At landscape scale, the team ran focus group discussions in the four new watersheds and asked key community informants to imagine the best possible rainwater management strategy for their watershed, using an adapted form of the happy strategies game to understand which practice fits where and how it may need to be combined. Factors limiting adoption – which are beyond farmers’ influence – are identified in the process. They result in a set of interventions needed to enable the adoption of the strategy. The 600 farm household surveys have been collected and are all geo-referenced at farmstead – all in close collaboration with partners. Data entry will begin soon and the team plans a ‘writeshop’ to run the first analysis of the data with partners – to develop partners’ capacity to work with statistics and write analysis reports. Find more detailed descriptions of the watersheds and how data has been collected on the blog of one of the NBDC researchers involved in the project. The Nile BDC project on targeting and scaling out rainwater management innovations (N3) recently held a partner meeting in Ambo. 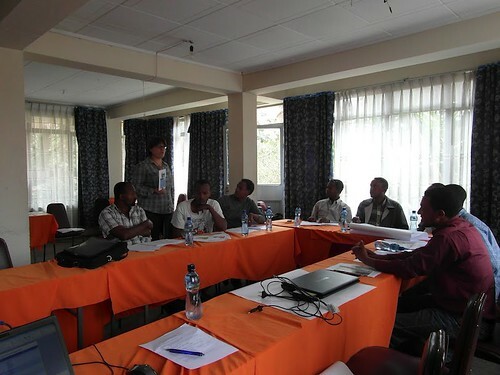 Partners, including the Amhara Regional Agricultural Research Institute (ARARI), the Oromia Agricultural Research Institute (OARI) and the Ethiopia Rainwater Harvesting Association (ERHA) joined. They discussed preliminary feasibility maps showing where each rainwater management practice is likely to be feasible and planned data collection, namely a farm household survey and focus group discussions to validate the maps. In a first stage, participants selected four sites next to the existing three NBDC sites (Diga, Fogera and Jeldu) to help validate the new maps. The four new sites are: Shambu and Ambo district in Oromia region as well as the Gummera (Maksenit) watershed and Zefie (Debre Tabor) watershed in the Amhara region. In a second stage, participants discussed data collection and used the happy strategies game. The participants decided to adjust the game to the particularities of the communities concerned, simplifying it and only focus on practices the community has knowledge of. Participants also reviewed and shortened the relatively long farm household questionnaire that had been developed. The N3 partners will be mainly responsible for data collection. Data analysis will be done in close collaboration between the partners and N3 team in order to allow some capacity building on statistical tools. The N3 team is looking forward to getting this important data and learn more from the study sites. (By Mulugeta Habtemichael and Catherine Pfeifer).